Congratulations to SZC: Beyond Dead, the GameSalad Game of the Month February! 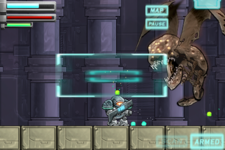 Developed by Ash Jackson (asthmj), Beyond Dead is exciting Metroid inspired platformer with fantastic original art. 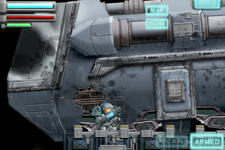 Drawing thematic inspiration from titles such as Dead Space and Resident Evil, characters Tank and Vera, a team of mercenaries, explore an astroid facility in space and battle zombies and aliens. This game is a fun romp through stark space facilities that will delight fans of classic SNES titles. 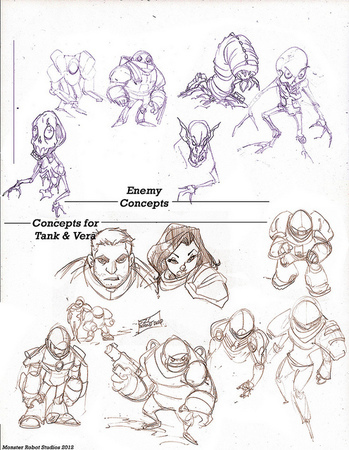 Before discovering GameSalad, Jackson’s background was rooted in art, primarily drawing caricatures and comic book art. He was the artist for comics such as Eve: Vampire Diva by Arcana Comic, Beautiful Creatures by RED 5, and Kenneth the Conjuror by Sunset Graphic. Currently he also does work for the online (soon to be print) comic, Afterlife Inc.
Before discovering GameSalad, Jackson had a very limited amount of prior coding experience. Now, when he is not drawing caricatures and comics, he is making apps in his free time. He has made three games to date. Most notably, Bridge the Gap for the iPad which received roughly 20,000 downloads during its first three days of release. Pricing and Availability: BeyondDead 1.0.1 is only $0.99 USD (or equivalent amount in other currencies) and available worldwide exclusively through the App Store in the Games category.